My thanks to Carol and Ken Sayner of Snaith for their invaluable help and assistance with this section of the website. 'Pictures of Snaith', published by the Snaith Historical Society in 2007, is available to purchase in Snaith or contact me for further details. 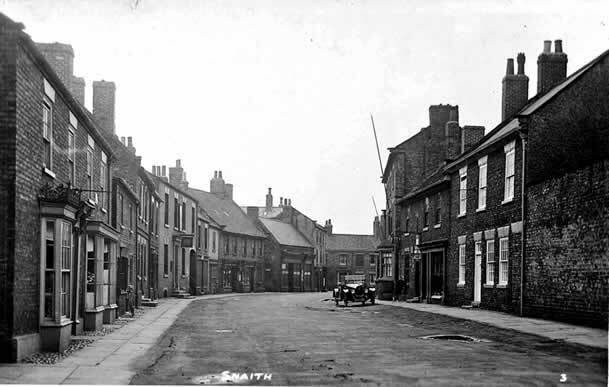 Click here to view further old photos of Snaith available for order. The early history of Snaith is not well documented. In 1853, a skeleton and Roman coins were unearthed in in Priory Garth, Snaith, suggesting a Roman presence there. The local area certainly saw Anglo-Saxon settlements but the town itself is hard to trace. The name Snaith (also referred to as Snaed, Esneit etc in earlier times) could refer to a detached piece of land, or a place cut off, but although there are brief references in the Domesday Book of 1086, there is little detailed information. This could be because Snaith was, at the time, part of a Royal manor. Around the year 1100, the king gave the 'rectory' of Snaith to the archbishop of York, who in turn gave it to the Benedictine abbey at nearby Selby. The church of Snaith was a source of considerable wealth for Selby; for example, in the year 1292 it brought in an additional revenue of £153 6s 8d. However, in 1310 William Greenfield, Archbishop of York, pronounced that 'the Abbot and convent of Selby' should be allowed 'to place two of their monks in the church of Snaith to be continually resident'. This small cell of Benedictine monks remined at Snaith until its dissolution under the juridiction of Selby. Although the cell of Snaith consisted only of two monks, one of them took the title of prior and the other was the sub-monk. On 12th October 1535 an order was issued from the manor court at Snaith 'that the prior, sub-monk, and all the priests of the church of Snaith, shall not go forth from their own houses, or the house in which they table together, after 8 o'clock after noon in winter, and 10 o'clock after noon in summer, on pain of forfeiting to our Lord the King 6s. 8d, for each offence'. Soon after this announcement, however, drastic religous changes were to affect Snaith. From 1536 onwards, under the authority of King Henry VIII, large numbers of monasteries, priories, and other religious insitutions were suppressed and their lands and assets seized by the crown. When Selby Abbey surrendered on 6th December 1539, Snaith, as its dependent cell, went with it. After the dissolution, the monks were pensioned off; in the list of Selby abbey pensions is included James Laye, prior of Snaith, who was to receive £6 per annum. Sir William Babthorpe and his fellow commissioners, on 23 May 1540, valued of the 'sell or parsonage of Snaythe ... over and above the stipends of two parish priests and one chantry priest' as £12 2s per annum. The 'mansion house with edifices and a garthyng' at Snaith which they described was probably in Priory Garth, which is now partially underneath the railway. The priory church of St Lawrence suffered from the removal of its income from the abbey, and in 1607 it was said that the chancel was in decay and 'very loathsome for any to see it'. N.B. The 'peculiar' of Snaith survived until 1857. This was an ecclesiastical area, exempt from the jurisdiction of the bishop, and it had its own courts. The records were kept in a room over the church entrance porch until 1858. In 1223 Snaith was granted a Charter by King Henry III to hold markets and fairs. Until 1585 the market was held on a Sunday, then it was changed to a Friday. In 1782 the day was changed to a Thursday, because other markets (eg. Wakefield) were held on Fridays. Butter was a particular Snaith speciality and was sold from buildings adjacent to the east wall of the churchyard. 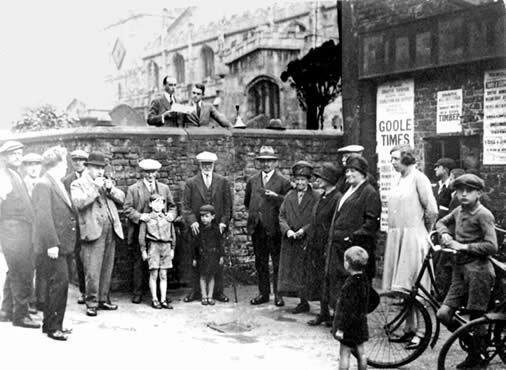 Leonard Holmes reading the Snaith Market Charter over the church wall, with Leonard North on his left. "Oyez, Oyez, Oyez, I ... Lord of this Fair and Market, in His Majesty's name, do charge and command that no person go armed or make any riots or unlawful assemblies to the breach of His Majesty's peace on pain of imprisonment. Also no person forestall any goods coming to be sold, but buy the same openly. Likewise that all persons do sell their goods in the said Fair in such places as the Bailiff shall direct, and there pay their toll-stallage and any other duties to the proper officer who is allowed to take same. That a Court of Piepowder will be held tomorrow when all persons may have redress who have been wronged in the fair; that the Constables of Snaith keep sufficient watch that no persons sell any goods but during this Fair which begins today at 11 o'clock sharp and continues until tomorrow at 8 o'clock in the evening and no longer. A Piepowder Court was a special court organised by the town on the occasion of a fair or market; it had unlimited jurisdiction over events taking place in the market, including disputes between merchants, theft, and acts of violence. The court's name originates from the French phrase pieds poudres (literally, '"dusty feet"), referring to the wandering lifestyle of the travellers who would attend such fairs. Some say that the nearby Snaith Lock-Up was built to house the temporary prisoners associated with the Piepowder Court. One amusing story tells of the prisoners being brought jugs of beer by their friends, which were passed to them through the small cell windows which only had a single bar. To prevent this, extra bars were added to the windows; in response, however, the friends brought along not only the beer but also long churchwarden-style pipes. The bowl of the pipe was placed in the beer and the mouthpiece of the pipe passed through the bars to the prisoner, who could thus drink quite happily! In 1379 there were 187 householders in the town. We get an early picture of the town on the Inclesmoor map of c.1407, which shows Snaith with a church with a tower, surmounted by a spire and surrounded by cruck-framed buildings with thatched roofs. The parish of Snaith was vast and consisted of around 34,000 acres. It stretched well into the marshland, right upto Adlingfleet, and, until the mid-19th century, the inhabitants of Goole were part of the parish too. This can cause confusion to anyone searching for a Goole ancestor, as the 1841 census indexes will actually list them as being in Snaith! Hook was a chapel of the mother church at Snaith, as were Airmyn and Rawcliffe. The east and west churchyard walls at Snaith were repaired by all of the townships in the parish: some say that the number of yards represents the size of the township, but this is only a suggestion. Goole was responsible for 16 yds (east from the Priory wall), Hook 17 yards, Airmyn 18 yards 2 ft, Rawcliffe 24 yards, Snaith and Cowick 34 yards, Balne and Pollington 20 yards, Heck 27 yards (from the great gate to Gowdall gate), Gowdall 24 yards, Hensall 19 yards, Carlton 28 yards (to the Priory wall). It is also said that, as the parish was so large and so many bodies were brought to Snaith for burial, this is the explanation for the fact that the churchyard is so much higher than the surrounding town. One of the largest local landowners in the Snaith area in the late 16th century was Nicholas Waller. There were actually two men called Nicholas Waller at this time: father and son. The elder lived at Sykehouse and the younger at Balne. It is sometimes difficult to decide which of the two is being referred to. In fact, the son died before the father. There is, at the Borthwick Institute at York, a fascinating document dating from 1623 which gives an idea of the extent of the property owned by Nicholas Waller the elder. It is dated 18 June 1623. These are edited extracts. and Thomas Bosevile of Warmsworth, gentleman. Lands, tenements, and other properties belonging to Nicholas Waller within the parish or lordship of Howden, now in the tenure of John Dunne of Howden and lately purchased from Robert Bankes of Howden. The document explains that Nicholas Waller had one daughter, Thomasine. She had married Thomas Wormsley and they had two daughters; Susanna (lately the wife of Jervis Bosevile of Warmsworth, deceased and now Susannah Vincent, wife of Thomas Vincent) and Sarah, now the wife of Edmund Yarburgh. The properties at Arram and Adlingfleet were to be held for the use of Susanna Vincent and her heirs. The properties purchased from Thornhaigh, Vicars, Jobson, etc, with properties in Snaith, Cowick, Gowdall, Hensall, Pollington, Balne, Womersley, Fulham, Kirk Smeaton, Little Smeaton, Wentbridge, Thorpe Audley, Campsall, and Kirk Bramwith, with the tithes at Pollington and Balne, and the nine closes called Smallhedge at Fishlake, were to be held for the use of Sarah Yarbrough and her heirs. The properties at Little Airmyn, Drax, Marton, Ganstead, Bilton, Turmer (including Turmer Hall), Welwick, Holmpton, and Humbleton, were to be held for the use of Thomas Bosevile, gentleman, the son and heir apparent of Susanna Vincent (and therefore Nicholas Waller's great-grandchild) and the heirs of his body. If Nicholas Waller were to die before Thomas Bosevile reached the age of 21, the trustees were instructed to hold his share of the inheritance for the uses of his sisters Susanna, Elizabeth, Mary and Margaret Bosevile, until he reached his majority. The property at Great Airmyn was to be held for the use of Edward Bosevile, another of the sons of Susanna Vincent. The property at Howden was be held for the use of Godfrey Bosevile (another son). Nicholas Waller also made provision of an annuity of £70 for Katherine Waller, the widow of Nicholas Waller of Balne Hall, Esq., deceased; he had been Nicholas Waller the elder’s son and heir. Nicholas Waller the elder died 24 January 1625 at Balne Hall and was buried at Snaith. As can be seen from the above document, Nicholas Waller the elder was tremendously wealthy and the owner of the former priory lands, the rectory, the tithes, Snaith hall and the town windmill. He seems to have been charitably inclined. During his lifetime he allocated the proceeds of 'the small tithes' to pay for an incumbent at Snaith - ie. a vicar. He also left the provision for a bede house or hospital for '6 aged or impotent men or widowers', which stood west of the church. This was pulled down in 18th century and rebuilt in Crosshill by Charles Yarburgh. Nicholas also left the money - £30 p.a. - for the building of a schoolhouse. It was eventually built by his executor, Edmund Yarburgh, and still stands in the corner of the churchyard. The school closed in 1877. After Nicholas Waller's death, the Snaith lands, Balne Hall, and much else passed to his granddaughter Sarah (b. 1589), who had married Edmund Yarburgh in 1611. The Yarburghs were now in effect the lords of Snaith, living in the hall and owning much of the land. Edmund died in 1631, leaving four sons and one daughter. His widow Sarah was living at Snaith Hall in 1643. She died around 1662. A detail from the enclosure map of 1754, showing the Yarburgh family home, Snaith Hall. 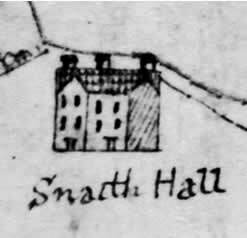 This is the only representation of the original Snaith Hall which I have come across. Edmund Yarburgh's son and heir was Sir Nicholas Yarburgh, who, by 1642, was a knight and a supporter of King Charles I. Sir Nicholas had married Faith Dawnay at St Saviour's, York on 26th May 1635; she was the daughter of John Dawnay, who was in turn the son of Sir Thomas Dawnay of Cowick. Sir Nicholas and Faith moved from Balne Hall to Snaith sometime between 1647 and 1649. After the king's defeat, Sir Nicholas paid a fine of £600 to parliament in order to enable him to keep his property. He died in 1655. Faith died on 24th September 1657 and was described in the Snaith registers as 'of Snaith Hall, that good lady, one of a thousand'. After her death, the inventory of the hall included books in the library (£10), the clock in the hall (£2), and all the plate (16lbs troy weight, £61 17s). Nicholas and Faith Yarburgh’s children were Thomas (the heir, b. 19th August 1637 at Snaith Hall), Nicholas, Richard, John (died 1645), John, Edmund, Christopher, Elizabeth, and Faith. Their grandmother, Sarah Yarburgh, survived their parents. Sir Thomas Yarburgh inherited from his grandmother all the property in Snaith, and also received from her 'a silver salt cellar, 12 silver spoons with knopps, a gilt tun, with a cover, and 2 broad wyne bowles'. "Her eyes were small, her eyelashes long and white, and her complexion sallow. She did not understand French and was coquetish and ridiculous." Presumably he was not an admirer. All we know of Sir Thomas is that he had 'flaxen hair'. The Duke of York was godfather to their eldest child and their eldest daughter (also Henrietta Maria) became a maid of honour to Catherine of Braganza. Thomas and Henrietta had 16 children; 6 died as infants. 12 were baptised at Snaith. Sir Thomas Yarburgh was high sheriff of Yorkshire in 1673 and the MP for Pontefract in 1685 and 1688. His wife, Lady Henrietta, wrote Lady Yarburgh’s Book of Meditations and was living at Snaith in 1693. She died before her husband. Sir Thomas died in Middlesex in 1716. An inventory of Snaith Hall, taken after his death in 1716, enables us to get an idea of the size of the house. Listed were: the hall, the parlour, the drawing room, the great room above stairs, a passage, the kitchen, the back kitchen, a cellar, a pantry, the room over the back kitchen, a small room, a nursery, 2 bedrooms, Mr Dobson’s room, Mrs Margaret Yarburgh’s room, the brown room, the green room, the Indian room and a menservants' chamber. Most rooms were empty, but two bedrooms appear to have been fully furnished. In the white room was a bedstead with 'blew mohair curtains'; in the room called the Alcove was a bedstead with silk damask curtains. Sir Thomas's heir was James Yarburgh (born c.1663/4). He was a godson of King James II and had been a royal page. He became a Lieutenant Colonel of horse and an aide de camp to the Duke of Marlborough. James Yarburgh married Ann Hesketh of Heslington Hall in 1692. After this marriage Snaith Hall was deserted, as Col. Yarburgh preferred to live at Heslington Hall. There is no evidence that Snaith Hall was ever lived in again, and it presumably fell into decay. James' wife Ann died in childbirth in 1718 and he died in 1730. They had 12 children. Their first child, Henrietta Maria, married John Vanbrugh of Castle Howard & Blenheim fame. However, James' son and heir Thomas Yarburgh (1696-1741) was cut off with a shilling for marrying without consulting his father. Instead, his brother Henry (1707-1748) succeeded to the family estate; after his death, the estate passed to younger brother Hesketh (1714-1754) and then to Charles (1716- 1789), the 11th child of James and Ann. The Yarburgh family name died out in 1852 with Nicholas Yarburgh when his nephew, Yarburgh Greame of Sewerby Hall, assumed the name and became Yarburgh Yarburgh. He died in 1876 and was succeeded by his sister Mrs Lloyd. On her death, the property then passed to her younger son, the Rev. Yarburgh Gamaliel Lloyd, who was then a vicar in Lincolnshire. On coming into his inheritance, he changed his name to Lloyd-Greame and his son, Colonel Yarburgh George Lloyd-Greame, inherited in 1890. There is a large collection of the Yarburgh papers, referring to the Snaith estates, at the Borthwick Institute at the University of York. This seems particulaly appropriate as Heslington Hall, the Yarburgh home for many years, is now part of the university.